It took us about 7 month to finally buy the 7500. 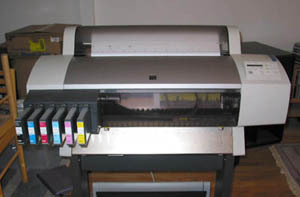 We hoped for an replacement model from Epson (using their 10000 technology) and/or a price drop. Neither happened and we finally gave in. Owning a 7500 has the advantage that it's cartridges are have no chips. That means we can later modify the printer and use other inks for B&W printing. Recently we even considered to get an Epson 10000 but finally gave up on this idea as it was just too big (for our living room). Got the printer at 10am and the first test print looked good. But then I realized that the network connection was slow and finally gave up using the network card and used a notebook as printer server. Then printing worked technically fine but I could do whatever I wanted and did not get the good results shown with my first test print. You can imagine that I did not have a good night. Also have some trouble with the cables we put into our crawl space (probably the wrong spec?). The symptoms are slower print speed. Then got an extra 50' cable and the network connection works fine with ImagePrint (a RIP) but still does not work using the Epson drivers through the same IP port. What surprise: This morning the same settings now work like a charm and the prints are pretty good. I use the profiles from a friend (sorry cannot post them) and hopefully it will be a better day. Still not sure what happened? Printer for longer time out of power? So I have to wait until it happens again (or hopefully not). Quality so far? I just love it! Photo Gloss paper (24" x 100' roll, featured here) Great gloss paper. Hahnemuehle Water Color Paper 285 gr (Sheets 13x19" featured here). I might need to reduce the ink here. This was a much better day and I am glad to go with the 7500. Although the results are fine I know there is a long road ahead of our printing experience. Working with fine art papers make quality inkjet (Giclee) printers so interesting. Some of our photographs look more like paintings (pastel) so that fine art papers are a much better fit than the glossy/luster paper. Then there are other photos where we need the full gamut and contrast of glossy/luster papers. The good new is that the Epson 7500 gives you both options. I don't think that the Epson 7500 can beat a great Lightjet print in the photographic paper category (it comes close though) but using fine art papers and archival inks make the 7500 a winner. With the Epson 2000P I had the problem that the Epson Archival Matte and also the Crane Museo papers got severe warping (too wet) on the back using 1440 DPI (using 720 lowered the quality). But also I like both papers. Now the surprise: Both papers print very well with ImagePrint. There is no real warping on the back. Time will tell which of the papers we will continue to use. With the ImagePrint profiles there is some Metamerism visible at daylight in gray areas. Most of our prints are thought for indoor (tungsten) light so I don't think it is a major issue. Single sheets of 13x19" feed and print very well with the 7500. Thanks to all my friends (Greg, Jim, Jon, John) who encouraged me to get the 7500. I still think the 7500 is even better in print quality than I expected.